On Saturday 14th October, 28 Guides and Rangers from Bury St Edmunds and Mildenhall had a fantastic day exploring the exciting world of computer coding at the University of Suffolk’s Innovation Centre in Ipswich. The weather was sunny and perfect for the train journey from Bury St Edmunds, and the short walk along the scenic waterfront at Ipswich. 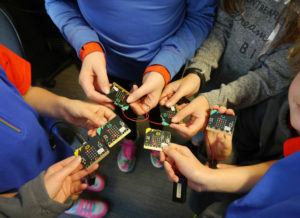 When they arrived at the ultra-modern Innovation Centre the girls were each given a Microsoft Microbit – an amazing pocket-sized computer which can be programmed to perform an incredible range of tasks. They then received a brilliant workshop hosted by tech wizards Jared and Tom. First the girls fired up their Microbits by exploring the interactive LED displays, and then connected the Microbits to computers. After this, they were well away, and spent the day constructing progressively more complex codes (which left some of the adults a little lost!) The Microbit’s inbuilt motion sensor allowed the girls to code all sorts of movement-triggered displays, and its Bluetooth features meant the girls could programme their creations to interact with each other! The girls got to keep their Microbits and were given a web address so they can carry on coding at home. The girls were all thrilled with how much they learned and achieved in just one day and many are now buzzing about the possibilities which STEM can open up. Guide Helena said “…it was so cool that I got to do all of this myself”, and Guide Heather simply said “I love it!” The girls and leaders would like to thank Jenni, Jared and Tom for the amazing opportunity they provided by organising the event and for sharing their expertise. The University of Suffolk and Girlguiding Northwest Suffolk Division are looking to build on the success of the day by arranging another larger event for their Guides and Rangers in 2018, involving other exciting technologies like 3D printing and virtual reality.